Harvested the first roud of garlic today. They were done I kept telling myself "it's too soon". So I broke down and harvested they came out pretty good this is Pescadaro Red. They are a smaller bulb variety also a Creole. This was 2 rows I have 4 more rows of a Cheznok Red and Music and a another row and half of Georgian Crystal. They can take a few more weeks in my opinion. Well here is the first go 'round. Not too bad. Here is the rest of my garlic waiting. Here is the Pescadaro Red Hanging in the Garage. I will get a fan on it very soon. The humididty is up here all of the sudden. hows the aroma? Nice harvest! DownriverGardener wrote: hows the aroma? Nice harvest! It heavenly. Especially since right now I barbecuing with that and the garlic in the garage. It is most nice. Cool man I harvest mine last week. I have mine curing in the garage whole garage smells like garlic. I love all these garlic pics and harvesting! I have mine curing in my kitchen. Just about 6 bulbs tho. I need to plant more this year. Gix, you've grown Music before haven't you? How does it normally do for you? I was thinking about getting some of that for the next crop instead of just getting mine from walmart. I think it's a soft neck variety right? Nice harvest! Looks like all of your bulbs are nicely divided and a pretty uniform size Something I'm still aspiring for. GardenRN wrote: Gix, you've grown Music before haven't you? How does it normally do for you? I was thinking about getting some of that for the next crop instead of just getting mine from walmart. I think it's a soft neck variety right? Yes those will be harvested next. They are a great all around (meaning tepmerate zones) kind of garlic. It does well and has big cloves, mine is doing good this year. All the people I gave this to last year say theirs is doing great as well. I highly recomend it. Great harvest! I am in SE Pennsylvania & planted mine in April. 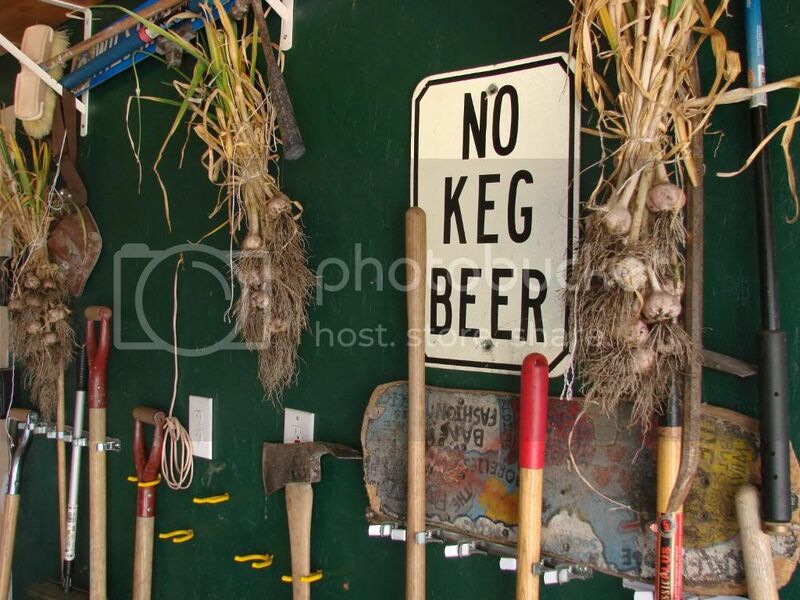 I read online that it is better to plant garlic in the fall & harvest them in the spring. Some of the growth is green and yellow. Any thoughts? This is my first time growing garlic. They look good Gix. Gives me something to shoot for. I'd like to see the Music garlic harvest too. Brandywinegirl wrote: Great harvest! I am in SE Pennsylvania & planted mine in April. 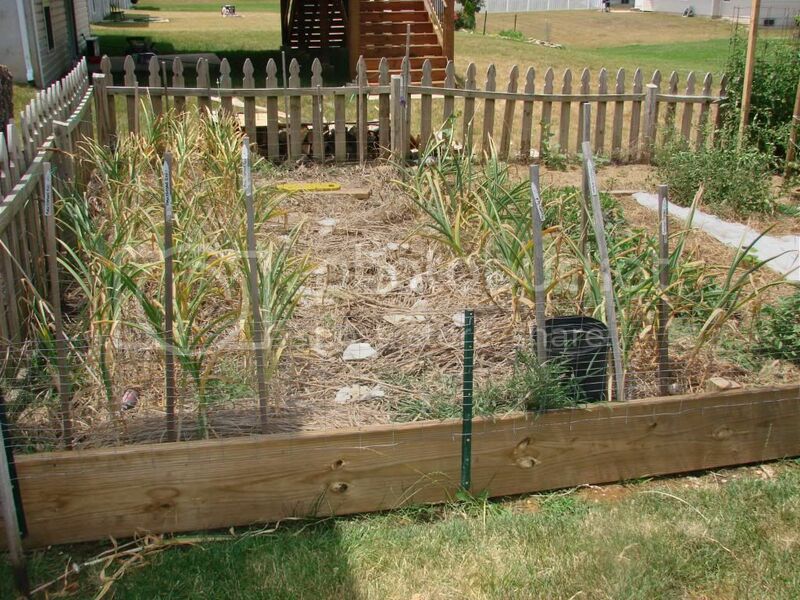 I read online that it is better to plant garlic in the fall & harvest them in the spring. Some of the growth is green and yellow. Any thoughts? This is my first time growing garlic. You should let them get about 2/3 yellow before harvesting. The ones I picked were almost over done. If you look at what I have in the garden still they are ready any time now. More than likely I will get them next weekend or possibly the following. DoubleDogFarm wrote: They look good Gix. Gives me something to shoot for. I'd like to see the Music garlic harvest too. Never fear you will, didin't I give you some Music last year? Keep in mind these are a smaller bulbed galric here, so no real monsters in this bunch. Though there are a few that are way bigger than the original bulbs. So that is something I can look forward too. Espeacailly since eveyrone say's this type of garlic (creole) only does good in the deep south. Never fear you will, didn't I give you some Music last year? Keep in mind these are a smaller bulbed garlic here, so no real monsters in this bunch. Though there are a few that are way bigger than the original bulbs. So that is something I can look forward too. Especially since everyone says this type of garlic (creole) only does good in the deep south. No, Not Music. I received my Music from my brother many years ago. You surprised me with Cheznok garlic. I kind of forgotten about those. They should be on one end of my garlic bed. When do you know the garlic is done curing? I pulled my garlic out over a week ago. All the foliage is mostly brown and dried up. I am keeping mine in the garage which is cool and mostly dark. I see people curing out in the sun, but I have read info saying not to do that. I am confused. I dry mine in the garage where it's warm. You definitely want it out of the sun. I usually keep mine out there for about 2 weeks. You'll know they are done when the outer skin is real dry like paper - just like you get at the grocery store. I don't think you can over dry them so it's better to be safe and dry them longer, especially if you have a large crop that you want to store for a while. 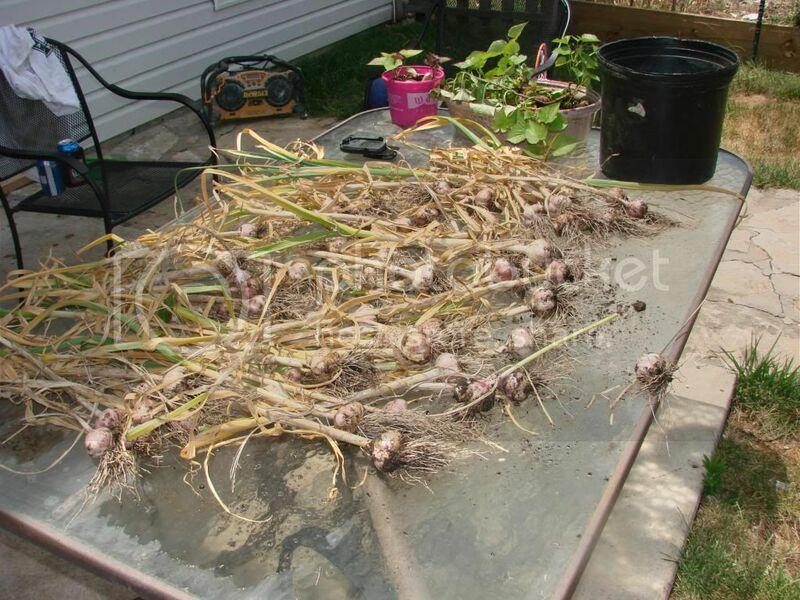 Harvested my Music Garlic today.